J. haematoloma featured on EOL's "One Species at a Time"
Adult Jadera haematoloma. Photo by C. Perreira. Jadera haematoloma was the subject of the Encyclopedia of Life's "One Species at a Time" podcast. Please click the link below to listen to the podcast. 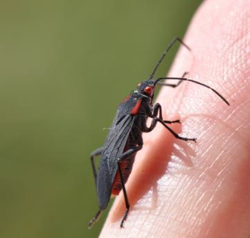 "One Species at a Time: the Red-shouldered Soapberry Bug (Jadera haematoloma)"